Current FEL releases are available for tasting at our sister winery, Cliff Lede Vineyards, in Napa Valley’s Stags Leap District. The tasting bar is open daily from 10am to 4pm. Appointments are not needed if your party is six or less. The winery is closed Easter Sunday, Thanksgiving Day, Christmas Day, and New Year’s Day. Exit the highway at Madison Street at the north end of Yountville and turn right (east). When Madison ends, turn left onto Yount Street, then make an immediate right onto the Yountville Cross Road. The winery is approximately 1.5 miles on your right. Turn west onto the Yountville Cross Road. 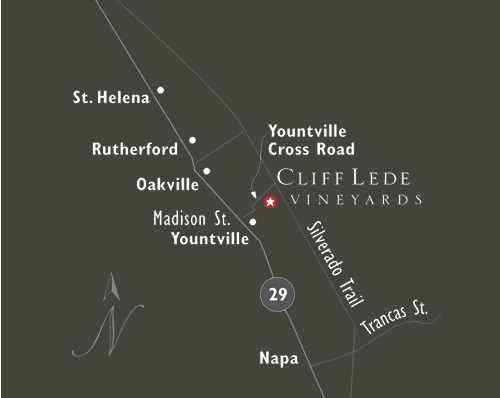 Cliff Lede Vineyards is approximately 1/4 mile on your left.